Fall is the perfect time to read a good mystery…..my fall reading is always full of mysteries, thrillers, suspense, and detective novel. We have had a few foggy mornings here in the Pacific Northwest so I couldn’t help but read yet another Lady Julia mystery! 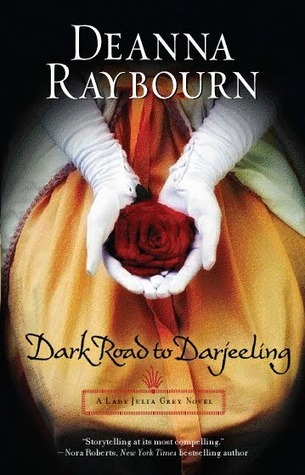 This book finds the newly married Lady Julia and her husband, Nicholas Brisbane, enjoying their honeymoon abroad when a couple of Julia’s siblings show up and beg them to join them on the road to India. Julia’s sister, Portia, is sure that her long time friend and lover, Jane, is in danger. Jane recently abandoned Portia for a more ‘conventional life’ with Freddy Cavendish in India. When Freddy turns up dead under mysterious circumstance leaving his pregnant wife Jane alone in a foreign lan, Portia fears something sinister is afoot. When they arrive, it becomes clear that something has indeed happened to Freddy but the problem is, everyone in the small English community in the Indian mountains all have motive to kill Freddy, including Jane. Julia and Brisbane must sort out who is friend and who is foe. This book read slow for me. The previous book read super fast but this one just didn’t have the same pacing for me. It could have been because Brisbane was absent in a large portion of the book. For me the chemistry between Julia and Brisbane is strong and moves the plot, not having them together for a large chunk of the book, slowed things for me. Also I struggled with their relationship…..yes now they are married and it’s clear that they love each other more than anything, but I couldn’t help but feel like Brisbane was being far too conventional in his idea of what their marriage would be like. I think he thought she would let him do his thing and listen to him……but clearly he hasn’t accepted that the woman he married is far from ‘normal’ and is she didn’t listen to him in the previous three books, why would marriage suddenly make her listen? That kind of bothered me throughout the book. The same goes for Julia….I felt like they are both chaffing against their marital exceptions. I never felt like their relationship evolved or changed in the book. At the end I still felt like things were at a stalemate between the two so I am looking forward to the next book to see if things resolve or improve. This wasn’t a bad book and or lackluster installment by any means…..I just felt like the other books were simply better. One of the things that I love about Raybourn’s mysteries is that she isn’t afraid to go down a darker, taboo road when it comes to motive for her murders. The motive is always unpredictable and shocking and this book did not disappoint! The murderer and motive were interesting and will intrigue the reader. I liked the change of scenery in this book. The exotic location helped break up the typical ‘foggy London’ setting so may Victorian murder mysteries have so I liked that change. I loved Raybourn’s descriptions of the Indian landscape and customs. While this book wasn’t as good as some of the others, it wasn’t a ‘dud’ at all. It was engaging and I loved the twists in the murder mystery and the uncertainty of who the killer might be based on everyone having motive, including a close family friend. It was definitely still worth the read and I did enjoy it. Let’s face it, any book that came after Silent on the Moor, for me just wouldn’t compare because the third book was so so so so right up my alley! I am looking forward to seeing what’s ahead in the next book for Lady Julia and her husband…..the next book’s description sounds delightful!